Say goodbye to discoloration and hello to flawless skin with fast and simple IPL Skin Treatments. Nothing makes you feel better than seeing your scaring red marks from previous acne problems disappear leaving a fresher even skin tone & a new looking you! IPL Skin Pigmentation treatments work by transmitting heat from the IPL light through to the pigmented skin areas. The IPL technology is attracted to dark pigmentation scaring, effectively drawing the discoloration to the surface of the skin, allowing the dermis to begin the healing process of correcting the blemishes over time. IPL Photo Rejuvenation treatments are often the perfect complement to Skin Pigmentation Treatments. When used in conjunction with each other, you can not only treat acne pigmentation, but also rejuvenate your skin leaving you with even skin tone and an even clearer complexion. Organica Day Spa is a small boutique day spa offering many different skin treatments & facials for aging, age spots, wrinkles, acne, face lifting, capillaries & pigmentation. The other beauty treatments include facials, manicures, pedicures, waxing, massage, reflexology, cellulite treatments, herbal spa bath, infrared sauna, ionic detox foot spa, wraps, stretch mark & skin tightening treatments. we are 10 min south of Noosa and 5 min north of Coolum Beach on the Sunshine Coast. Treats wrinkles, pigmentation, sun damage, acne & red scars, redness, freckles and broken capillaries. IPL Photo rejuvenation is often considered the most effective skin treatment available today. Photo rejuvenation is a breakthrough treatment that can correct a variety of skin conditions with pulses of safe, filtered light penetrating the epidermis, or top layer of the skin targeting the dermis underneath where the melanin and haemoglobin reside. The affected cells are destroyed and either absorbed via the lymphatic system or removed by the body (micro crusting). A beneficial side effect of this IPL skin treatment is the stimulation of collagen production, improving skin texture and fine lines and restoring the skin to a more youthful state. IPL Pigmentation clears & lightens the ‘red only’ and ‘brown only’ skin marks quiet significantly. The light is attracted to dark areas so this suites fairer skinned people the best. This is a suitable way to treat both brown skin pigmentation (sun damage and hormone related melasma) as well as red skin pigmentation. Be warned though, continued exposure to sun or other aggravating factors, pill, hormone imbalances left untreated means skin pigmentation will develop again over time so it is advised to maintain the good effects with follow up treatments every year. IPL spider vein removal treatments transfer light energy from the IPL penetrating below the surface of the skin and is absorbed by these small blood vessels (spider veins). The heat caused by the absorption of the IPL energy causes the veins to collapse together, closing off the blood flow and eliminating the superficial spider veins targeting the haemoglobin (blood) in the veins or capillaries associated with these conditions. 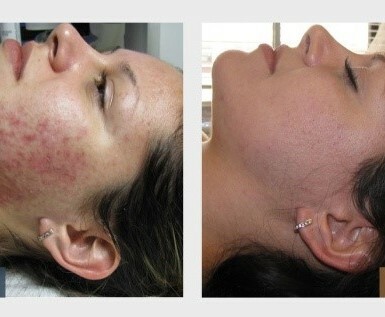 IPL acne therapy is an effective new light-based treatment revolutionizing the healing of acne & blemished skin. IPL Acne Therapy destroys the most common bacteria that cause acne — without drugs, without pain and without downtime. The IPL system has FDA clearance for the treatment of acne. What Is Acne? How can we help? Acne most commonly develops when skin cells don’t shed properly – the cells stick together and plug up the pores. This blockage encourages the oil called sebum and a bacteria called propionibacterium (P. acnes) to build up in the skin pores, leading to inflammation. The oil is produced by the sebaceous glands. An acne breakout starts in the skin’s tiny holes, commonly called pores. It takes about two to three weeks before a blemish shows up on the skin’s surface. Deep within each pore is a sebaceous gland that works to produce sebum, the oil that keeps skin soft and moist. As the skin renews itself, old skin cells die and are shed off. Under the best circumstances, this happens evenly and gradually, making way for fresh new skin. But some people shed skin unevenly and as a result, dead cells mix with sebum clump together to form a sticky plug. This plug traps oil and bacteria inside the pore — the beginning of a blemish. During puberty, hormones accelerate oil-producing sebaceous glands into hyperdrive, putting teen skin at particularly high risk for acne. The IPL skin treatments available at our Sunshine Coast salon works well in combination with other treatments as well such as LED, RF lift treatments, Skin Tightening, Ultherapy, Peels, Microdermabrasion & Oxygen treatments depending on what your treating. Call us today on 5471 3777 for more information about our IPL skin treatments and to make a booking at Organica Day Spa. We look forward to seeing you soon!